More power could push the BMW i8 into supercar territory. Last year, with an updated design, improved range, and a beautiful new Roadster variant. But what we’re really waiting for is a more powerful model that pushes the hybrid sports car into supercar territory. After all, BMW hasn’t built a true supercar since the beloved M1. The updated i8 coupe uses a hybrid powertrain featuring a 1.5-liter three-cylinder engine and 11.6kWh electric motor resulting in a total power output of 369 hp, allowing the i8 to hit 0-62 mph in 4.4 seconds. Speaking to at the Detroit Auto Show, Head of BMW i Product Management Alexander Kotouc revealed that the automaker is considering a performance-focused version of the i8 coupe. According to Kotouc, there is enough demand to justify developing a more powerful BMW i8 supercar, but it needs to befit the BMW brand. 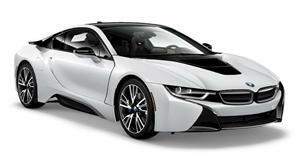 “I can tell you at this point we are still evaluating it; the i8 is the iconic sports car of the new era. Yes, there is customer demand for a more powerful version but it needs to make sense for our brand,” Kotouc added. “You could put a V12 in there and it would be incredibly powerful but would it still be a BMW i car? We need to find the perfect balance." Should a more powerful BMW i8 coupe get the green light for production, it would likely adopt the “S” badge to signify its performance, much like the for the i3 range. Kotouc also said that BMW could extract more power from the i8’s existing powertrain, but added that it could be fitted with a completely different engine if necessary. “There is a customer need and desire to have more power and we will try to fulfill it while also keeping our DNA authentic,” he explained. Just as the original i8 was a bold attempt to redefine the sports car, a more potent S version could potentially shake up the supercar world.